2.2 Navigating in OptiSurface Designer – Welcome to the OptiSurface Support Center! 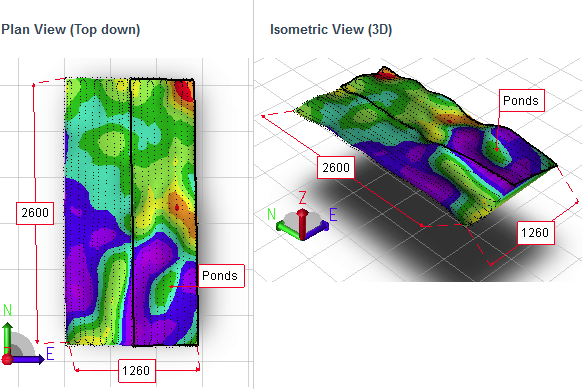 In OptiSurface Designer, you see the terrain in the 3D scene. You can navigate through this 3D scene using a mouse or keyboard arrow keys. Rotate - In pan mode, you can hold the <Shift> key down, then left click and drag the mouse to rotate the scene about the Z axis. Also press this toolbar button , then left click and drag the mouse to rotate the scene about the Z axis. Orbit - In pan mode , you can hold the <Ctrl> key down, then left click and drag the mouse to orbit the scene around it's centre. Pressing the up, down, left or right keys on your keyboard will pan the 3D scene in that direction. You may need to click inside the map window first for this feature to work. Plan View – View the terrain from top looking down. Side View – View the terrain from front looking horizontally. Isometric Screen – View the terrain in 3D perspective. Tip – You can also tilt by clicking and dragging the North Arrow with your mouse. The following figures show a comparison view of a field with and without tilt applied. You can adjust the appearance of the terrain if you would like the elevation to appear more pronounced. To do this, click Tools Menu > Project Properties and change the Vertical Exaggeration Factor figure. You can set it to any value between 1 and 100. A common setting is 30, which achieves an obvious elevation appearance.